Build your wealth and your forces so you can defeat the evil hordes of Draconis and become the champion of the land. In Draconis Invasion, players take on the role of leaders recruiting defenders and actions to be able to defeat the invading hordes from Draconis. While players have the same enemy, they are also trying to defeat the most enemies and complete the most campaigns to become the king’s champion. Each player starts out with the same set of 12 cards in their individual decks. On the table is a pool of cards – defenders, actions and treasure – that you can purchase to add to your deck. The goal being to take your weak deck and build it into a well oiled machine that can take out more invaders than the other players. Attack cost: After you’ve purchased a defender, once it ends up back in your hand, you’ll need to use the gold in your hand to pay the attack cost allowing you to use the defender. This adds a new element to balancing your deck between the types of defenders you acquire and the cost you’ll need to use them. Terror cards and terror die: Terror cards can be added to your deck in a variety of ways, and for each one players discard the terror die goes up. Each time you reach 6 on the die you draw an event card that in turn acts as a count-down that eventually ends the game. Event cards: You’ll start each game with an event card deck of 9+ cards (the number of cards depends on the number of players). These event cards usually penalize the leaders in the game (ie: the player with the most invader kills). Once the event cards run out the game will end. Campaign cards: These cards take an action to draw, but don’t become part of your deck. Instead, they each show a mission requirement of killing a certain amount of a specific invader type, and when completed will reward you with more points at the end of the game. Battle Stages: While you can randomly choose the pool of actions and defender cards for each game, Draconis also offers a campaign of ten “Battle Stages” with set action and defender cards. It’s a nice touch that offers a sense of progression over multiple games rather than playing one random game after another. A player has defeated six invaders or 2) the final event card has been drawn. Players will then count their Glory Points earned from defeating invaders and completing campaign cards. The player with the most glory points wins the game! Draconis Invasion is a very well produced game, and the first thing that stands out are the amazing illustrations that pull you right into the fantasy world of Draconis. Next is the super sturdy box with enough room for plenty of expansions (yes please!). Also included are divider cards and foam inserts that allow you to customize how you’d like to arrange all the cards for easy access. The square invader cards give you that extra special sense of accomplishment when you gain them, and the custom terror die is the cherry on top. There’s a lot of fun to be had playing Draconis with your family, and the rules are easy to pick up on. The art and theme are a bit on the dark side (like the Lord of the Rings movies), and the game has a suggested age range of 14+. While you can play with up to 6 players and there is plenty of player interaction, this isn’t a party game. There is a good chunk of luck with card draws and terror events. But strategy gamers will enjoy the range of choices when building and adapting their own deck to become a fine-tuned point-earning machine. The rules of Draconis are a bit deeper than a basic deck building game, but are still easy to learn. Casual gamers that have played a deck builder before will feel right at home. You should definitely give pointers to new players so they aren’t overwhelmed by all the options at the start. There’s a lot of depth to Draconis, and plenty of elements that differentiate it from other deck builders. The real fun, that avid gamers will enjoy, comes in discovering those awesome card combinations and building your deck to see how they play out. Because of the many moving (and somewhat random) parts in Draconis, there are times when it can feel a bit unbalanced. Power gamers might get turned off by that aspect, where other gamers might not even notice. We liked the way the event cards acted as a game timer. There were times where we felt that the game would end right when we were finally getting the more expensive cards in our hands and were able to defeat the more powerful invaders through advanced card combinations. This is easily remedied by adding more event cards to lengthen the game based on your group’s preference. What we enjoyed the most in Draconis Invasion was experimenting with the various action and defender cards and finding those awesome card combinations that are so gratifying to pull off. If you’re a fan of deck building games and the fantasy theme, Draconis Invasion is definitely a game you should check out. May the best champion win! 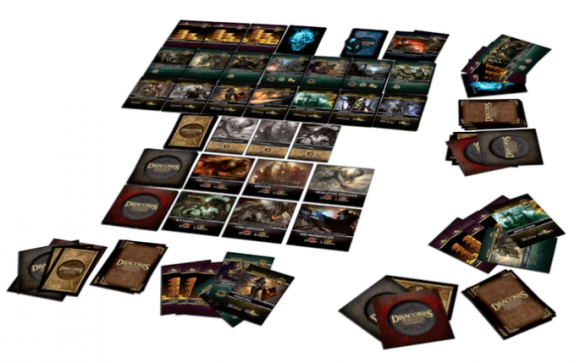 Battle the dark powers of Draconis in the ultimate medieval fantasy deck-building game. With over 500 beautifully illustrated cards. Draconis Invasion is a fast-paced strategic deck-building card game for 1-6 players. You and your friends must fight the forces of evil in a beautiful dark fantasy world. Players take the roles of noble Heroes in this 45-minute tabletop game. Defeat vile invaders while recruiting powerful defenders, garnering gold, and completing secret campaigns. However, as the battle rages on, fatigue and fear will begin to take their toll, bringing your soldiers to their knees. This is a fun fantasy streamlined deck building game. It has a strong theme and storyline and fantastic artwork. Positives: It is set in a fantasy environment where you recruit a group of Defenders to defeat the Invaders. You start the game with the most basic Defender cards and minimal gold cards. You build up your gold and recruit Defenders throughout the game hoping to defeat the stronger enemies. The Terror card mechanic in the game is a unique concept. You have a pile of Terror cards that are constantly being added to your deck and the opponent’s deck throughout the game. Each time a terror card is discarded in anyone’s deck, the terror counter goes up (The terror counter is tracked by a 6-sided dice). Once it is rotated to 6, an Event card is drawn from the Event deck. Once the Event deck runs out, the game is over. The Event deck is scaled to 3 cards per player. It has a hurry up and get it done before time runs out feeling. The game takes 30 to 45 minutes and does not drag on like some deck builders can because of this terror card and event deck timing mechanic. Negatives: Some of the card actions seemed counterintuitive with the mechanics of the game. For example, in competitive play the Cursed Fury and Werebear cards gives an opponent terror cards but that still hurts yourself since all the terror cards that are discarded, no matter which player discards them still effect you because there is only 1 event deck. I guess the only time I can see using those cards if I’m ahead in the game in Glory points and I’m trying to end the game faster. That seems very situational though. The other downside from the games I played was that it turned into a rush to kill as many of the weak Invaders as you could before time ran out. We only ended up killing 1 Invader from the Yellow deck (which has the more powerful Invaders) in 3 games. Summary: I felt like this game was fast and streamlined compared to a lot of deck building games. It was very fun. It also has great potential for growth. I did feel like it fell short in a couple areas but I quickly remedied it using the variants below. Once I started playing this game with the variants I think I would bump my rating up to a 9. Variant 1 (cooperative): I tried a full cooperative game with 3 players to 40 victory points. We used Casualty of War, Buried Gold, Shapeshifting, Ruler of the Ruins, Rush to Battle, Reinforcements, and Dawn of Hope Action cards. And we used Imperial Guard, Gladiator Elite, Dread Knight, Warlord, Valkyrie, Dragon Slayer, and Sorceress for the for the Defenders. Variant 2 (Competitive): I also played a competitive game with 3 players. The Action cards were, Casualty of War, Cursed Fury, City Siege, Betrayal, Enchantment, Growing Darkness, and Courage. The Defender cards were, Arcanist, Werebear, Shaman, Beast Rider, Stone Titan, Dread Knight and Fire Mage. I did make some card text changes for this to work. Cursed Fury, Betrayal, Arcanist and Stone Titan were changed to give Terror cards to all other players and not yourself. I gave everyone their own die and event deck of 3 cards each. We played to 15 Glory Points (must defeat at least 1 Invader from the Yellow stack) or whoever had the most Glory points when the game ended. Which ever came first. If your Event deck ran out, you were out and the remaining players continued on until the game ended. Both these Variants were extremely fun. I highly recommend it! Add a Review for "Draconis Invasion"